NOTE: Date must be in the form YYYY-MM-DD, like 2018-10-02. Williamsburg, KY - A goal in each half propelled the Lindsey Wilson men's soccer team to a 2-0 win over host Cumberlands (Ky.) on Tuesday night at the UC Soccer Complex. Renan Ramos and Andrew Revanales netted the Lindsey Wilson goals while Noah Slepicka and the Lindsey Wilson backline posted their fifth shutout of the season. Slepicka ended the night with five saves in the victory. 2018-10-02 - Birch Rd., Eastern Adair Co., KY - Photo by Tommy Bailey. 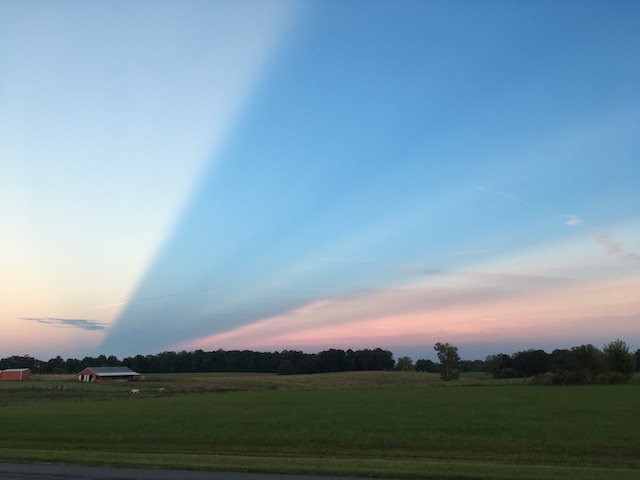 Tommy writes, "Went out looking toward the west for a sunset that wasn't suitable, turned around started back in the house and looked directly to the east and there was this unusual cloud formation. Maybe I should look to the east more often." Georgetown, KY - The Lindsey Wilson volleyball team defeated Georgetown (Ky.) in straight sets 3-0 on Tuesday night in Mid-South Conference action at the Davis-Reed Alumni Gym. The Blue Raiders (19-3, 8-0 MSC) managed 40 kills and a .316 hitting percentage on the night as the Tigers (12-6, 4-1 MSC) recorded 36 kills and were limited to a .120 hitting percentage. Lindsey Wilson also recorded six service aces for the match while allowing zero by the Tigers. Williamsburg, KY - An 88th minute Cumberlands (Ky.) goal snatched a victory from the Lindsey Wilson women's soccer team in a 2-2 draw on Tuesday at the UC Soccer Complex. Lindsey Wilson (3-2-2, 1-0-1 in the Mid-South Conference) grabbed a 2-1 lead with an own goal in the 83rd minute. Sina Cavelti sent a shot towards the goal only to have a Cumberlands defender knock it into her own goal to give the Blue Raiders the short-lived advantage. Frankfort, KY - The Kentucky League of Cities (KLC) bestowed a 2018 "Friend of Kentucky Cities" award on Representative John "Bam" Carney (R-Campbellsville) at the Capitol Annex in Frankfort. Representative Carney sponsored House Bill 424, a KLC initiative that returned local representatives to the 911 Services Board. She was a beautician in her career, born April 8, 1936 in Russell County to the late George Elford and Letha Bradshaw Hayes. Mary Helen Morgan, 82, of Florida, formerly of Russell County, KY, died Saturday, September 29, 2018 at her home. Funeral service for Mary Helen Morgan will be at 12noonCT Saturday, October 6, 2018 at the Bernard Funeral Home Chapel with Bro. Charles Edwards officiating. Visitation 10amCT to funeral time. Interment will follow in the Jamestown City Cemetery. The Adair County 4-H Program will be holding its 8th 4-H Country Ham Auction that will take place on Thursday, October 11, 2018, starting at 6:45pmCT at the Adair County Cooperative Extension Service, 409 Fairground Street, Columbia, KY. The ham auction will take place following the 4-H Awards Banquet. All the hams that will be auctioned off have been produced by local 4-H youth who participated in the 2018 4-H Ham Project. As part of the project each youth had to cure two country hams and these were placed in the Adair County 4-H Ham House in January. Stella Hadley Knight, age 68 years, 8 months, 6 days, of Russell Springs, KY, passed away Monday, October 01, 2018, at Russell County Hospital. Visitation will be Thursday, October 04, 2018, from 5pmCT until 9pmCT at Wilson Funeral Home Chapel, 391 E. Steve Wariner Drive, Russell Springs, Kentucky. Funeral services will be at 11amCT on Friday, October 05, 2018 at Wilson Funeral Home Chapel, with Bro. Phillip Miller officiating. Interment will follow in the Owens Cemetery, Damron's Creek Road, Russell Springs, Kentucky. The Lindsey Wilson men and women's soccer teams travel to Mid-South Conference competitor Cumberlands (Ky.) on Tuesday. First kick for the women's match is scheduled for 4pmCT, followed by the men at 6:30pmCT at the UC Soccer Complex, 141 N 11th St, Williamsburg, KY.
Edmonton, KY - On September 30th, 2018, at approximately 11:24amCT, Trooper Ricky Cross and Deputy Josh Neal executed a search warrant at a residence five miles east of Edmonton on Billy Sparks Rd. While searching the residence, units located methamphetamine, marijuana, prescription pills, straws, baggies and digital scales. 43 year old Jeffrey Campbell of Edmonton was located inside the residence. Kentucky is one of only six states to receive GEAR UP funding from the U.S. Department of Education in this year's competition, making it the Council's fourth GEAR UP award. For more than 30 years, a woman who was found strangled in a refrigerator near Interstate 75 in Kentucky has been referred to as a "Jane Doe." On Monday, investigators released her real name. In June 2017, Kentucky State Police asked the public for help after all leads in the woman's death went cold. The news got around to a North Carolina family who thought the woman found in Knox County on April 1, 1985, may have been their relative, Epsy Regina Black-Pilgrim. Come Home To The Hill is the theme of this week's Lindsey Wilson College homecoming celebration - honors will be bestowed, four days of special events will be ongoing and a homecoming king and queen will be selected at the big football game. COLUMBIA, KY. -- Five alumni and two longtime friends will be honored during Lindsey Wilson College's 87th homecoming celebration, Oct. 4-7. The awards luncheon will be held at 11 a.m. CT on Saturday, Oct. 6 in the Roberta D. Cranmer Dining & Conference Center, 430 Helen Flatt Drive. Adair County (October 2, 2018) - On October 1st, 2018 at approximately 12:15 PM CST Trooper Billy Begley was on Campbellsville Rd, Columbia, KY attempting to locate a stolen gray 2006 Ford Escape. Trooper Begley observed the suspect vehicle traveling south bound on Ky 55. When Trooper Begley initiated his emergency equipment in an attempt to initiate a traffic stop, the driver fled and ran through a red light at the bypass intersection of north KY 55. No. 4 Lindsey Wilson volleyball travels to play Mid-South Conference member Georgetown (Ky.) at 6:30pmCT on Tuesday, October 2, at Davis-Reid Gymnasium, 400 E College St, Georgetown, KY.
Friday, September 28, 2018: There is an empty seat at the family table and a deep sense of loss for you. May you be comforted by the prayers of loving friends, strengthened by the warm memories of your family's love and devotion, assured by the faith of our Lord Jesus Christ, and committed to carrying on the rich legacy of your family and Ed. He would want you to move forward in living a full and abundant life. Today we come together to offer our prayers and concerns and to take a moment to honor and celebrate the life of Ed Waggener. And that is no doubt exactly what Ed would want us to do - to take a brief time to celebrate who he was and what he did and then move on to the opportunities that are before us. The challenge in honoring Ed's life lies not in having too little material to share, but rather in how to best to give an overview to what is a remarkable life and a unique individual. CAMPBELLSVILLE, Ky. - Aaron Boaz, primarily a classical violinist, will present a solo violin recital Thursday, October 4, 2018 at 7pmCT/8pmET in The Gheens Recital Hall in the Gosser Fine Arts Center at 210 University Drive, Campbellsville, Ky. The program will include a number of virtuosic works, including "Danse Espagnole" by Manuel de Falla, a Sonata by Sergei Prokofiev and "Devil's Dance" by John Williams. At 11:15amET on Monday, October 1, 2018, Campbellsville Fire Rescue responded to a fire at 201 McNary St., Cambpellsville, KY. Firefighters were on the scene within 3 minutes, had the fire extinguished within 6 minutes, and left the scene just 38 minutes later at 11:53amET. "Campbellsville Fire Rescue was dispatched to a report of smoke coming from a residential structure. Upon arrival firefighters found light smoke coming from the structure. Firefighters extinguished the fire, conducted a primary search and provided overhaul to the residence. There were no injuries and moderate damage to the house." Twelve Firefighters were on the scene, with four fire trucks/apparatus. Also responding were: Kentucky Utilities, Campbellsville Police Department, Campbellsville Taylor County EMS. During the month of September, 2018, there were 18 traffic accidents investigated by the State Police working in the Post 15 area in the 11 counties of Adair, Casey, Clinton, Cumberland, Green, Marion, Metcalfe, Monroe, Russell, Taylor and Washington. --Robert Stone, Tuesday, 2 October 2018.